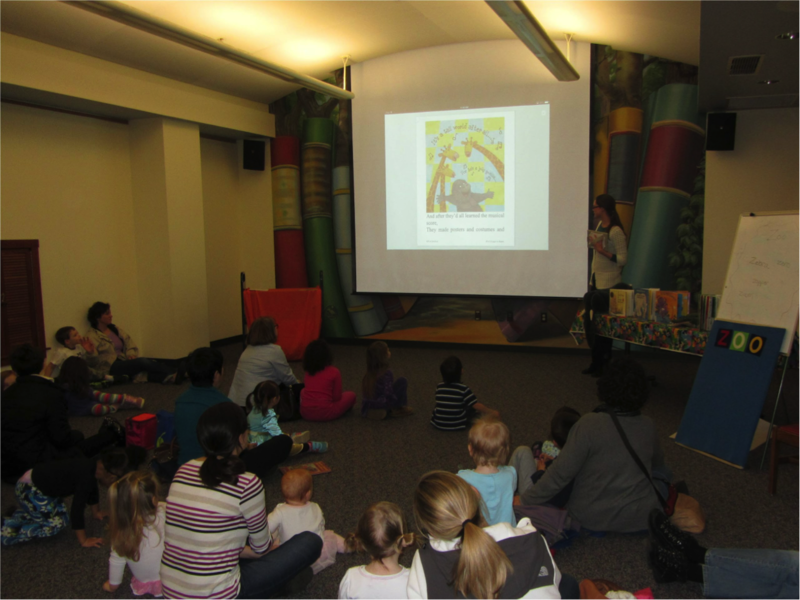 Our iPad storytime philosophy is evolving here at CCPL. We posted a bit about what we were up to almost a year ago in a post here on LittleeLit: iPad Storytime @ Carmel Clay Public Library, Indiana. Since then, we’ve been experimenting with using a projected iPad in various programs, with varying degrees of comfort among the presenting librarians, and then we’ve been monitoring the in-house circulating iPads. We had been trying iPad/technology-specific programs last spring, and then we shifted to what we called “21st Century Storytimes” in the fall. Our subtitle aimed to clarify what that meant (“blending the traditional and the techie”), but the goal here was to highlight the technology as a tool–not to constrain ourselves to technology alone, but to use it as one option among many. These programs were met with mild approval and relatively low attendance. So we’re rethinking this particular program model. The following examples demonstrate how we have been using the iPad just a little or a lot in existing programs, depending on the objective or theme of the program. Sometimes we incorporate the five circulating iPads along with using the projecting iPad. Notwithstanding various challenges, we have found the iPad to be a valuable tool for storytimes, offering great new apps, using technology many of our patrons are already familiar with, and improving how we present old favorites. For “Monday Madness,” an action-packed weekly program for school-aged kids, the kids played Angry Birds with the iPad. A Girl Scout program used the Lemonade Stand app, assigning two girls to each iPad to figure out the supplies they would need for their business. When our library’s webpage was redesigned last fall, we showed it off to a homeschool group using the iPad to project it onto the big screen. One of the features we highlighted was Tumblebooks–we showed the participants how to access it from our children’s page, then watched a National Geographic video we found there called “Eating Insects”! We projected a fireplace on the wall via YouTube to “warm up” the space for some cozy campfire stories, finished off with a rousing version of “Campfire Pokey”! 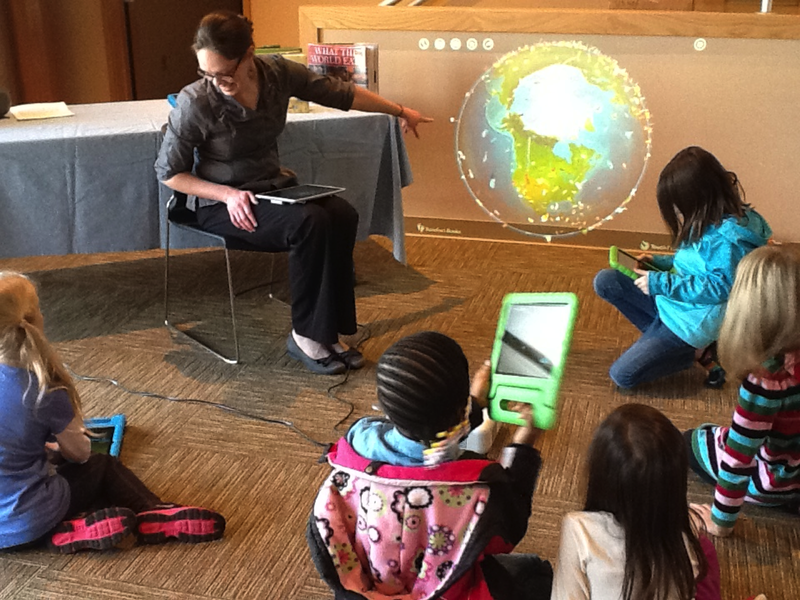 The Barefoot Atlas app [see photo above] offered a dramatic way to travel around the world and find different foods; the app was projected onscreen, and the kids were paired up to try it out on their own using our circulating iPads. We’ve played with several apps, including Flip, Flap, Farm; Smoothie Felt board for a winter clothing activity; and Touch and Learn: Emotions, an app featuring facial expressions, which we used to name the emotions represented. We downloaded an ebook, ZooZical by Judy Sierra, and projected it while reading it aloud [see picture below]. We have our plates full with lots of storytimes and other programs on the calendar, and as you can see, we are finding more and more ways to use the iPad to enhance the experiences. The increased use of this device has brought about many questions from parents about about how to choose among the millions of apps marketed to children, and we are happy to share what we’ve learned. Recently we’ve also begun teaching parents how to use the parental settings on their iPads (and other devices) to encourage child safety. We’re making more headway all the time with these efforts, and our increasing collaboration with the local school system helps. Carmel Clay Schools use Common Sense Media for their digital citizenship curriculum, so that’s one resource we can pass on to parents of preschool children; another is the American Academy of Pediatrics. So what’s next for us? We want to use the iPad in more ways, in more programs. We have a preschool STEM storytime in the works that will make use of the device. We also would like to regularly post app reviews and recommendations to our department blog (and Pinterest). Finally, we’re trying to figure out how to better utilize our five circulating iPads, since they haven’t been quite as popular with library visitors as we had hoped. Even with school-age apps added to the offerings, the iPads just aren’t in high demand. So of course, we will be watching LittleeLit for more amazing ideas! Posted on March 14, 2014, in Literacy and tagged Carmel Clay Public Library. Bookmark the permalink. Leave a comment.